A driving force in the creation of Cedar, Salmon and Weed was the impact of John Boom’s death on me. I was devastated, angered. After striking out, every which way, I settled on this novel, setting John, in the form of Gaz, as the protagonist. As the story, the fiction grew, Gaz had the life, death deprived John of. He got the girl; his house was finished, and he may well see grandchildren. This made me feel good. 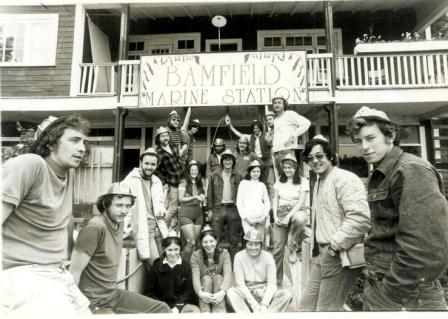 The first BMS summer student body (1972). John Boom, aka Gaz is front right. The photo was taken during Fire Daze and everyone had to wear a fire hat or… punishment might involve water. Photo by Bill Austin.